Located in Italy in the Graian Alps which are between the Aosta Valley and Piedmont regions. Gran Paradiso Mountain located in the park itself. 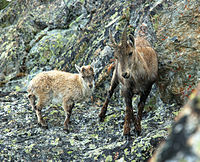 At first Gran Paradiso National Park protected the Alpine Ibex but it now also protects other species. All of the park’s mountains and valleys have been sculpted by glaciers and streams. At higher altitudes you can delight in alpine meadows. Gran Paradiso is the only mountain which is totally within the borders of Italy. From the summit of the mountain you can see Mount Blanc and the Matterhorn. Bordering this park is Vanoise National Park in France. The area which forms as a combination of both parks counts as the largest protected area in Western Europe and both parks co-operate in the managing of the ibex population as the animals move between both parks per season. The two main kinds of woods in Gran Paradiso National Park are coniferous and deciduous. On the Piedmont side of the park the most common are deciduous European beech forests. The forests are thick and dense. Other trees found here are larches, spruces, Swiss stone pines and silver firs. In the gulleys one can find maple and lime forests and in the Aosta Valley area there are downy oak woods. Alpine pastures can be seen at higher altitudes and they are full of flowers in late spring. The wildflowers here include wild pansies, gentians, martagon lilies and alpenroses. Inside the park at Paradisia Botanical Garden near Cogne there are around 1,500 plant species. In the summer in the mountain pastures visitors can see Alpine Ibex grazing. They descend to lower elevations in the winter. Other kinds of animals which can be found here include weasels, hares, ermines, Eurasian badgers, Alpine chamois and even wolves and lynx. Gran Paradiso National Park is also home to over 100 bird species like Eurasian Eagle-Owl, Rock Ptarmigan, Alpine Accentor, and Chough. On the rocky ledges you can see Golden Eagles nest and on the steep cliffs Wallcreepers. In the forests there are Black Woodpeckers and Nutcrackers. The park also has lots of different kinds of species of butterflies. The three most popular valleys in the park are Cogne, Valsavarenche and Val di Rhemes. For visitors there are great hotels and nice campsites. Along the marked footpaths are some mountain shelters. For those who prefer to visit in the winter there is good cross-country skiing.